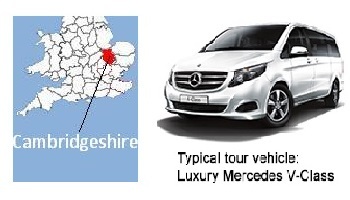 Your driver-guide will pick-you up from your central London hotel or place of residence at the specified time. We recommend 8am. After a fast-route from London, our Day in Cambridge Private Tour takes us to the famous university town, centre of academic excellence. Cambridge is a market town and the main square often bustles with traders’ stalls and carts. Visit some of its famous pubs, including the Eagle, a former coaching inn much used during WWII by air force pilots who burned their names onto the ceiling with cigarette lighters. A decade later, leading lights from the science community, Francis Crick and James Watson came and celebrated their discovery of DNA. Other highlights include the Fitzwilliam Museum, famous for 18th & 19th century art and classical antiquities, and the puzzling Mathematical Bridge… how on earth was it put together? Your driver-guide will suggest appropriate lunch options on the day. Perhaps a village tea-room, riverside restaurant or traditional pub. Alternatively, you may want to bring a pre-packed lunch or just grab a sandwich. It’s your tour, it’s your choice. (Note: Day in Cambridge Private Tour price does not include food or refreshments). Tickets to attractions. For this tour tickets to any attractions can be bought on the day.